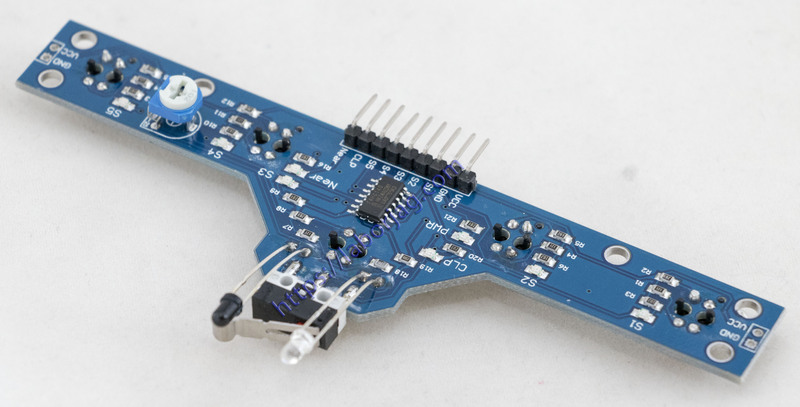 5 Channel Line Tracking Sensor Module (BFD-1000) is a sensor board designed for use with line follower robots. This module has been sufficient to meet the day-to-day task of tracking, but also with the infrared distance sensor and touch detection sensor, the board makes your robot design able to adapt to the situation easily. 1. BFD – 1000 integrated no.5 high sensitivity tracking sensor, for the environmental impact of small, can accurate tracking to complex black line (white line), for the simple black line tracking more comfortable. 2. BFD – 1000 integrated infrared barrie sensor, escapes distance can be regulated through the slide rheostat. 3. BFD – 1000 has a specially designed touch detection sensor, from the design of the robot is more simple. 4. BFD – 1000 all of the output signal to digital signal (v), convenient connected with MCU. 5. All sensor output state BFD – 1000 have LED lights as instructions, convenient debugging. 6. BFD – 1000 support voltage of 3.0-5.5 v meet the demand of most systems. 7. Using high sensitivity of the sensor, tracking range between 0.5 mm to 40 mm any change and don’t need to do any adjustment. High accuracy for tracking black line.